You are here: Home / Baby#2 / Baby: Nesting 2.0. Mama started making a nest. Sarah is throwing us a co-ed baby sprinkle later this summer and wants me to do a registry for anything we might need. (Just like getting married for a second time, I find it a little embarrassing to do a registry, but there are things we need. I just want to emphasize to guests that gifts are 100% not necessary! But just like the wedding, this is Thomas’s first newborn, so I know he wants to experience all parts of the fun of having a baby.) Anyways, before I knew what we might need, I had to take inventory of what we had. 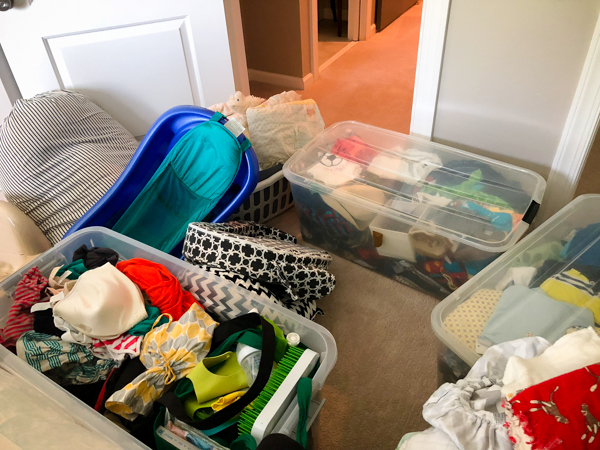 I gave away a lot of the baby stuff I didn’t think I’d use again, so I honestly didn’t remember what was pushed in the back of the downstairs closet or the attic. I was pleased with how much I found! After taking inventory, I though “Gosh, I don’t need anything!” And then I made some lists, and it turns out my need/want list is actually kind of long. BUT it includes a lot of inexpensive/easy to get items and most of the big ticket things we already have. Baby food maker (Emily just gave me hers!) and storage containers/pouches/etc. Toys – we have soooo many! A swing. Mazen only liked his for a short period and they are so darn big. But if someone gifted or loaned me one I’d be very appreciative. 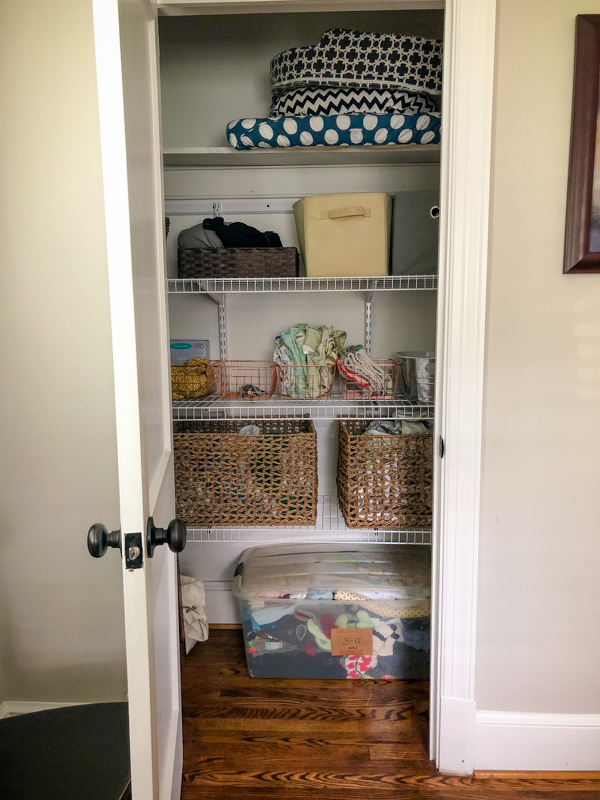 In the process of taking inventory, I cleaned out the office closet (moved everything to the spare room downstairs that will become the office again sometime this year) and then put the baby stuff in the nursery closet. I LOVE THE SHELVES that Thomas built! 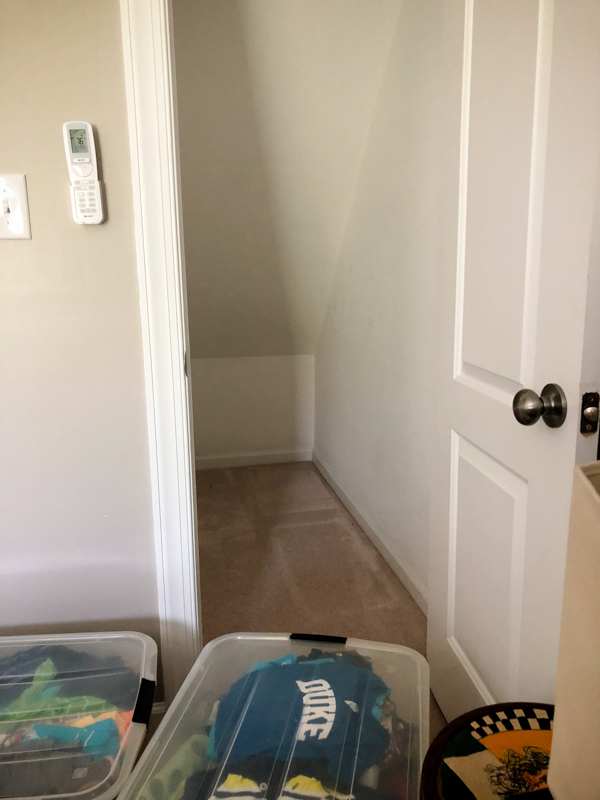 The big baskets have blankets, towels, and crib bedding and the tub on the floor is all of our 3-12 month clothing easily accessible when we need it. Lastly, I put all of the newborn clothing and nursing attire for me up in the empty dresser in the master bedroom. 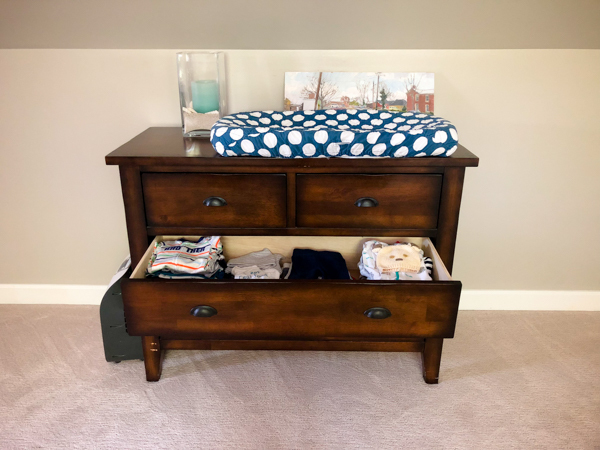 I’m imagining this dresser being our upstairs/nighttime baby storage and station for the first 3-6 months. And the nursery on the main level being the daytime diaper/clothing/nap area. Even though I’m not even halfway there yet, I feel super organized already. It’s so nice already having so much of this stuff! I’ve been reading some of Baby KERF and came across this to-do list post that I wrote about the same weeks last time – must be something about 17/18 weeks when the reality sets in. I was able to mentally cross of SO many things the second time around. I’m not planning on doing childbirth or baby care classes or reading a bunch of books this time. I have a crib, furniture, pediatrician, and nursing bras. I definitely feel more relaxed that I’ve done this once before and babies don’t really need much stuff. I also know that every baby is different, so we might take a different path this time around! As far as the old to-do list is concerned, buying an infant car seat, pack a hospital bag, and take a nap are the only important things we have to do in the next 20-something weeks! Hatch Rest- nightlight and sound machine. The sound machine can be controlled from your phone, this is ESSENTIAL when you have another child in the house! The nightlight can be any color, I prefer red for middle of the night feeds. It’s supposed to be less stimulating to allow mom and baby to fall back asleep more easily. A good baby carrier (I prefer my Lillebaby). Looking forward to following the baby posts! We bought a forehead thermometer off of Amazon and it works pretty well. I also hated our ear one! With our boy, we found there were never too many burp cloths or Muslim swaddle blankets! Hope you end up with loads of them! ? For your thermometer, our ped suggested a Safety 1st Thermometer that has 3 interchangeable tips when we had our first baby. The tip for doing a rectal temp is the best bc (when they are little it’s the only real accurate temp) it is shaped so it can only be used safely, you never have to worry about inserting too far and hurting them. It also has a mouth tip and underarm. We have used it for all of our kids and love it! I always influx’s it in baby shower gifts now. I know you can order it on Amazon, BB&B, Buy Buy Baby, etc. Good luck!! Hi Kath, I’m a long time reader of your blog and wanted to give you a suggestion for something you may want to add to your registry..
As a mom of three, I wanted to make a suggestion on a baby item that I didn’t have for the first two, but got for my third…it was by far the best purchase! Without turning on my pump, I was able to store 500+oz of milk in my freezer using this silicone breast pump! I struggled with supply with my first and was okay for my second. It’s only $12 on Amazon and was worth every penny! Check it out! So is this a milk catcher and hand pump in one? I had a milk catcher last time that was great (although I haven’t found it yet…hmmm…) and I also rarely pumped because I could catch the let down on the opposite side, but since I can’t find that one I might need a new one. This one looks nice! These are the best, I was going to recommend it to you! Haaka is the brand I used, but this kind looks identical. I haven’t seen that kind of changing pad but sure makes messes easier. I always put one of those disposable pads on top of my pretty cover and had to change it once a week or so, so it wasn’t too bad. What are boogie wipes? Never heard of those! How are they different from a regular baby wipe? Hi Kath! Many congrats to you, Thomas and Mazen on baby boy #2! I too am expecting another boy ( my 4th child and 2nd boy). I wanted to shoot out a suggestion for the infant seat carrier: Nuna Pipa Lite. This thing is a godsend!! Also not forget to put the adapters for the seat you choose down on your registry. The only bummer about the Pipa is that it doesn’t adapt to too many other strollers out there. Congrats and good luck!! I have 2 boys and it’s great! Neither of them wore socks that often. They survived. Hahaha!!! On their way to Brooklyn!! Say hi! Yay i am so excited! I can’t wait to see you in October!!! I’m sure you feel very confident about childbirth and baby care at this point, but I’m wondering if it might be helpful for Thomas to attend a childbirth class with you, since this is his first baby. You mean so I can make him squeeze and ice cube to simulate getting through a contraction? 🙂 🙂 Yes, we haven’t ruled it out. I’m thinking a one-on-one meeting with our doula might be just as helpful. 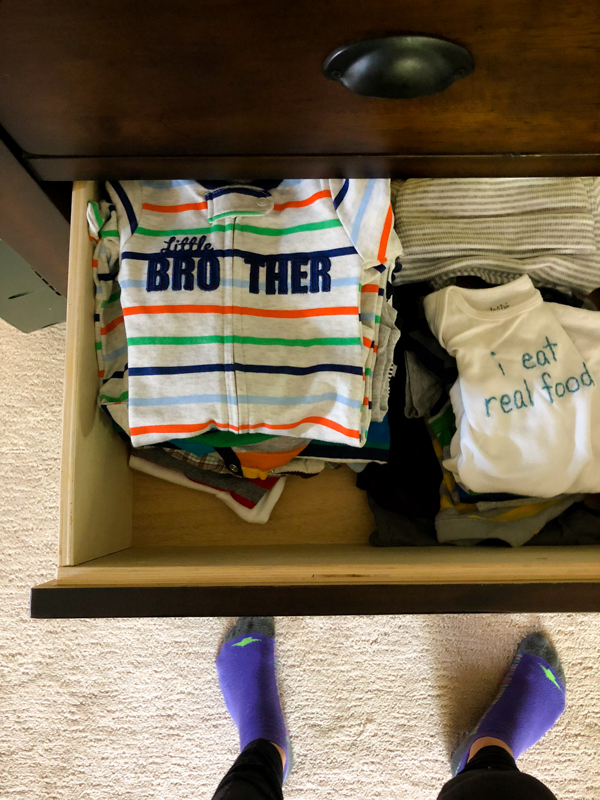 I love seeing how you’re preparing for baby number 2! Are you going to plan on another unmedicated hospital birth? I love hearing about births (The Birth Hour podcast is my jam! ), so I’m curious about whether you’ll go the same route you did with Mazen. Are you planning to hire the same doula? I hope to but it’s still TBD if she’s available. I have a second one I’d love to use too. I’m not sure you asked for suggestions, but I can’t help myself. There are a couple of things I just LOVE to pass on to other moms. We have the Braun forehead thermometer. It’s really convenient if you just need to confirm that baby is warm. But, I would definitely encourage you to have an old-fashioned rectal thermometer (and some Vasoline) handy, too. Our son got RSV at 2 months old and the forehead thermometer was consistently 1 or 2* off, which is a big difference when you’re talking about a newborn/infant, since 1-2* can make the difference of being hospitalized or not. With my daughter we had a Baby Delight Snugglenest bassinet that we kept in the bed between us for a few months. When we transitioned her to her crib, we just transitioned her in that for a while. My son, however, wanted no part of that. Everyone raved about the Dock-A-Tot, but I just couldn’t justify the price and I never had success with a Pack-n-Play, so I broke all my safe sleep rules and bought an auto rocking Rock’n’Play. I’d buy 100 of those, if I could. I would say it was the single greatest investment we made with him. He slept sooooo much longer in it and I felt really OK about it. Also, not sure if you’re doing a white noise machine, but I’d recommend that, too. We have Dohms and they’re amazing. I love this post! One of my favorite parts of pregnancy. So, i splurged and got the dock-a-tot for my second and i would move that sucker into the “NEED” catagory. The thing was a complete life saver. My baby slept SO well from day 5 (when we got home from the hospital). When she just recently outgrew it (at 10ish months), we ended up getting the grand. I could go on and on! Another thing i LOVED my second time is a ring sling. I had the boba wrap for my first, but ended up borrowing a Sollybaby wrap and loved it much more. it was lightweight and not as much material. But the ring sling was easy and beautiful and great. I ended up buying a My Wildbird sling. So excited for you! <3. Great to hear! I figured the Dock a Tot was just a fancy luxury item (although I have seen others write great things about it) so I’m glad to hear others swear by it! The Dock a Tot grand has also been awesome with teaching my son how to sleep in his toddler bed. Highly recommend both! My babies are 5 years apart and I definitely needed a few new items in between, especially burp cloths and some new fun things that weren’t “a thing” yet with my first. I was wondering, do you plan to encapsulate your placenta again? Do you have some left from Mazen? Just curious as to how that works. Thanks! I have some capsules leftover in my freezer so I plan to take those. I would do it again if it were an easier process, but it was kind of an ordeal to get it home and coordinate everything so I’m probably going to skip it this time to save logistics planning and because I have some left. If it was something the hospital did for you as an optional add on – now that would be convenient! First-time commenter, but I have to chime in about the Halo bassinet. We got one for my second son, and he would not sleep in it at all. Because the post is not stationary and centered, there is a little sideways pitch to the mattress, and when he was really small he would slide to the side and end up against the mesh, which he didn’t like. He also had reflux, and because of the odd shape of the mattress, there are not any wedges that fit. The base is also really heavy, and you can’t prop it up to even out the mattress or raise the head. It’s pretty expensive, and we were just disappointed that it ended up being just a changing station and place to toss clothes. All babies are different though, and I know lots of people love it. This is the first negative review I’ve heard but those things all make sense. My daughter hated the Halo. It ended up being a very expensive laundry basket until we finally put it away. Just to chime in on the other side, I used the bassinest with my second and loved it! I know everyone one/baby is different but it’s one of my fav baby items. So nice as a nervous mom (even with my second) to have baby high enough and visible enough to see her sleeping and breathing without sitting up. I was the third user of ours and two other moms have used it since us. I know they are expensive but they definitely last! I know people love to judge, but I think it is so sad that people feel like they can’t celebrate second or third marriages or babies like the first! With marriages, sometimes they don’t work, or sometimes a spouse is lost; why not celebrate new found happiness? Good grief. And with babies, they are a gift and a blessing, and each one deserves the roof to be raised. Go celebrate! I think this why people do “sprinkles” for second babies/marriages. Just as much celebrating, without as much pressure to spend money and buy lots of things. We love the temporal artery thermometer. You just scan the want across the forward to the temple. So easy and accurate. We all use it. I love that you can take their temps over and over with no grumping ;). You can get it at Costco, Amazon or Target, etc. We have had great luck with the Exergen one. It broke once (my oldest is 12) and they replaced it for free. Highly rec! Hey Kath, Where is that cute little chest from? The dresser is from World Market! All babies are different when it comes to liking/not caring about the swing. My youngest WOULD NOT nap anywhere but the swing for several months. Try to borrow one if you can in the event your new one is a fan. We loved the cradle-style that swung side to side. I would love to borrow one 🙂 Going to ask around! I LOVED the baby merlin magic sleep suit for my second baby…its great for when they start to roll over and can’t be swaddled any longer for safety reasons. Plus they look extremely adorable wearing them! With baby #2, my baby #1 definitely felt the change in how much attention she was getting. 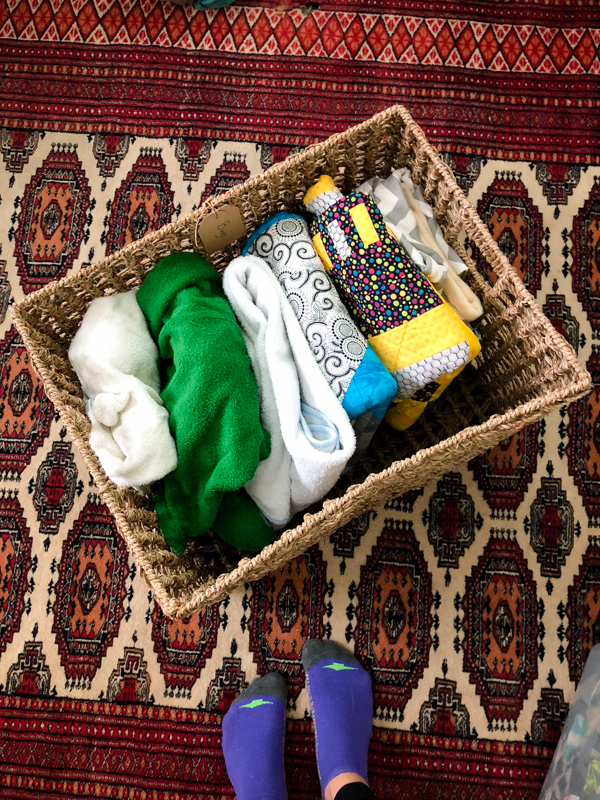 A couple things suggested to me that REALLY helped: 1: have an activity basket that comes out ONLY when trying to nurse baby #2 and 2: make baby #1 the big special helper and involve him/her as much as possible. I have heard good things about the merlin! Anyway, I am in awe of how organized you are even this early in the pregnancy! I felt like I was way less organized the second time around, although the whole pregnancy experience was definitely less nerve wracking! Excited to read more baby posts! LOL about socks. Maybe I will run out and impulse by a swing at the two month mark! I think it’s also the fact that it’s such a big item to having in your living room that has me thinking I might try to go without. And I think the only reason I am organized this time is because I had lists and gear leftover from the first time! The first time was so much more overwhelming to me. My first son hated the baby swing but my second loved it. The only way I could get him to sleep sometimes. Every baby is different. I wouldn’t get rid of anything you had based on whether Mazen liked it or not. Second baby mIght! Well the swing is long gone. I just don’t want to spend the money on another because they are so hit or miss. If someone has one to borrow I totally will though. Why do you think they’re hit or miss? Because Mazen didn’t like it? During times like birthdays and Christmas, do you appreciate being told exactly what the other person wants as a gift, or not? On one hand, come off as maybe, but on the other hand, it could be for me for the other person because then the giver knows exactly what to give to make the other person happy. I read back to the post you linked back to and was wondering what you decided about cord blood banking and placenta encapsulation? Are you planning to do again? Yes, had a great experience at Martha Jeff last time. Not doing cord banking, and I wrote an answer above about placenta but going to skip that this time and use my frozen pills up! Also look at the Nose Freda. It sounds gross but was a great tool with my first! I also bought a Snuggle Me Organic for my second baby, currently 28 weeks. It’s very similar to the Dock a Tot but less expensive and I like it’s a small business founded by a mom and available in organic materials. My two cents: don’t bother getting drool bins until you know if you need them! Our girl never drooled, so they felt like a waste. I am on my 3rd baby, and every single time I attend a baby shower/sprinkle I gift the same 2 items: Zutano booties and The Shusher. And every single time I get a thank you note about how they didn’t know the Shusher existed but they cant imagine their life without it! I haven’t heard of either! Oh man, our shusher was a LIFESAVER the first few weeks! The zutano booties are amazing! Those are the ONLY thing that will actually stay on a newborn’s foot. I had a few hand-me-down booties with my second and they were so great. I would highly recommend them! I saw this in a newspaper recently! I can’t get over the price tag, but I love Dr. Karp so I bet it works – whatever it does! All 5 s’s at once?! Just had my 3rd (colicky) baby boy. I was THISCLOSE to getting the Snoo. My pediatrician husband just wasn’t convinced. But, I have heard it is a miracle worker. I second Zutano booties (my babies get those or no socks at all)! I’m surprised you said a glider is overrated! My little guy will be 12 weeks tomorrow and we use our glider SO much! Like multiple times a day! We have a two story house and it’s upstairs in the nursery but I still go up there to feed/rock him for a change of scenery/less stimulation. We don’t use a wipe warmer, but I love our oxo wipe box – it’s weighted to hold the wipes down. Don’t forget to stock up on baby medicine cabinet stuff – gripe water, gas drops, baby Tylenol, etc. Oh, and the nose frida people make the most awesome baby nail clipper! It’s angled so you can’t nick the baby- it’s the best! We just use the digital themometer the hospital gave us, although we did buy one before, too. They recommended armpit temping only so as long as it’s fast, you’re good! I knew the glider comment would be controversial : ) We prefer to have a bed in the nursery so I just can’t fit both, but if I had a huge room I would totally do both! OH and I had that OXO box too and loved it but it’s MIA! Yay! I loved a bed for nursing (I did a ton of lying down nursing), changing clothes, and reading books. My parents bought us a Halo bassinet for our first. I liked it well enough, although our daughter was SUCH a loud sleeper we transitioned her to her own room (right across the hall from ours) earlier than I intended. I am now facing a medically necessary c-section in a couple weeks with my second and I’ve heard the Halo is even better for c-sections, so I’m extra glad we have it. I’ve seen some wedges advertised as fitting the Halo for reflux babies and they also have a couple new accessories, like an infant insert to make it cozier for tiny babies (it gets mixed reviews, but could be OK). 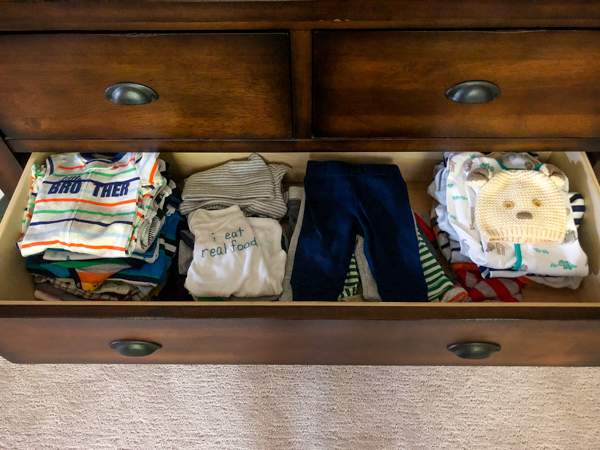 A couple questions – How many “newborn” size outfits are you planning on? We’ll be delivering early and I’m struggling with whether we have enough from #1. Second – what brand breast pump(s) do you have? I have my Madela PISA from #1, but I think my insurance will cover a new one and I’m wondering if I should switch it up or not. Congrats on #2 (or #1? or #1.5? since it’s Thomas’s first??)! The Halo bassinet was pretty much the only new thing I bought for my second baby and I did really like it, but I have to say the Rock N’ Play was more valuable! I’d try to borrow or buy a replacement – it was the single most useful thing for me in the infant months I think. And I second the recommendation for Zutano booties-they don’t go anywhere! What I didn’t like about the rock n play was how low it was. I had to get out of bed to see/touch Mazen. I really want something that is bed height and ideally can swivel over the bed. I’d prefer not to have the baby IN the bed because it might get a bit too crowded. I’m so curious which stroller/car seat your readers would recommend. Love how you organized these lists. Just as an FYI, you might want to look into the safety of crib bumpers before using them this time around. I am one of those super paranoid moms who follows everything AAP says, so take this with my paranoia in account. The AAP actually says no to the breathable mesh ones as well. https://childrensmd.org/browse-by-age-group/pregnancy-childbirth/are-crib-bumpers-safe/ Not trying to be critical just want you to be informed. ALSO congrats from one boy mama to another! I love the look of that!! I generally love back packs, but like that the regular Duo can be messenger so you can swing it around and grab something. I might end up with both kinds eventually. The backpack doesn’t seem to have quite as many pockets – do you find it to be spacious enough? I love our uppababy vista for an everyday stroller and the travel system was amazing. 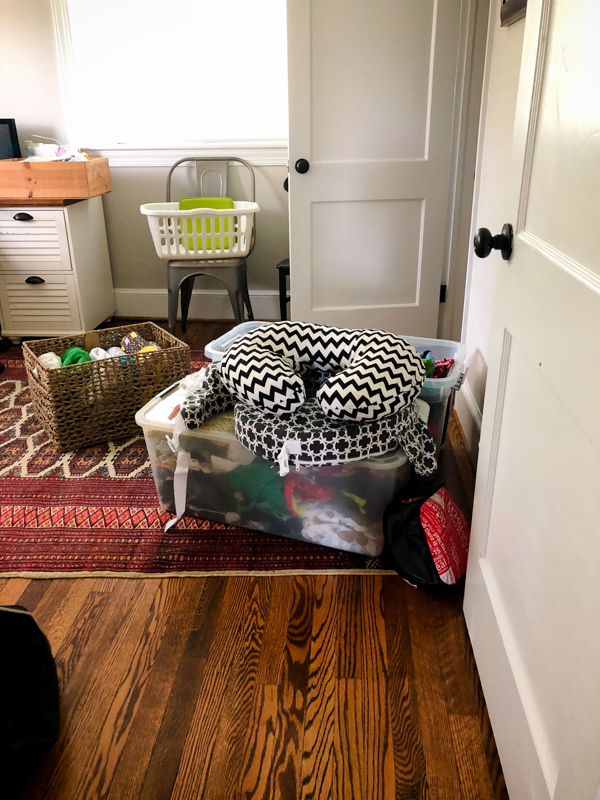 The halo bassinest is incredible – I resisted, but my mom got it for me, and it was my favorite thing. I also disagree on the glider/rocker as I feed my almost ten-month old in it daily before bed. Hopefully you’ll have a good sleeper, but a good reclining rocker is the best. GIRL! Skip Hop is soooo 2012 (I know because I had my first in 2012 too lol, and I’m totally joking, I’m sure Skip Hop is still great). Get yourself a bag that is both diaper bag AND cute modern bag. I have had ones by Timi & Leslie over the years and there are other cute ones out there – it has been nice carrying something that looks basically like a big purse but with all the benefits of diaper bag pockets/cleanability etc. haha. they have nice looking ones though! I just remember loving the outer pockets so much. Please send recommendations with lots of pockets! So I don’t have a problem with this because I’m a veterinarian but I used a regular digital thermometer rectally for as long as possible – it’s the most accurate way to temp a baby! Otherwise we’ve been pretty pleased with one of the forehead thermometers, sorry, can’t remember brand. I hate ear thermometers! We are pregnant with our baby number 2, also! It’s so funny to me how much stuff I thought I HAD TO HAVE for baby 1 and how much more chill I am this time around. Thermometers: our doctors have always recommended to good ole’ fashioned regular digital thermometer. The most accurate temperature reading for babies is a rectal read. I know it isn’t fun, but it is the most accurate. Skip the baby socks and get a couple pairs of Zutano booties. They snap around the ankle so they stay on when baby would normally kick socks off. Plus not sure about your dog but mine would have the sock in their mouth before I even realized it fell. They’re a little pricey but they hold up great! We really appreciated doing a second time around birth refresher. Also really got a lot out of the bringing baby home workshop based on the John gotten book – baby makes three. Really worth reading and the workshop was awesome – all about how to prepare your relationship for a kid and havin parents. Found it super valuable to prepare for our second, you know the real deal when you are already parents. Ok,’ I didn’t take the time to read all of the comments, so I apologize if this has already been said, but apparently spit up stains get worse with time. When I got my old burp cloths out I couldn’t believe how stained there were! Laying them out in the sun gets rid of the stains! To keep in your back pocket in case you swaddle… for my escape artist nephews the Woombie was a life saver and kept them sleeping for hours longer than any other swaddle! I just love your well organized list. And i really appreciate it. I am going for apply it with my baby hope so it will work for me. Thanks for the sharing such a informative article.